The optimal strategies to treat peroneal nerve injury of multiligament injured knee remain controversial. New surgical treatment strategies are being investigated focusing on nerve transfer techniques as opposed to nerve grafts, tendon transfers, direct nerve repair or neurolysis. The nerve transfer seeks to restore ankle dorsiflexion by transferring a fascicle of the tibial nerve to the motor nerve of the anterior tibialis muscle with minimal donor-site morbidity. Nerve transfer requires multidisciplinary cooperation with surgeons familiar with peripheral nerve reconstructive techniques. This chapter will focus on our approach to complete peroneal nerve injury in patients who sustained a knee dislocation. 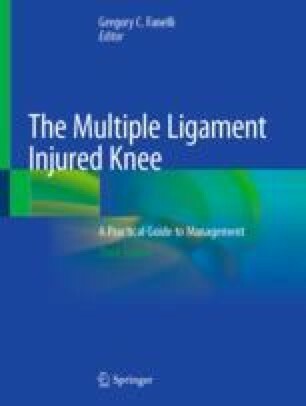 Particular attention will be placed on the mechanism of injury, imaging, surgical technique, and a review of currently available outcomes.